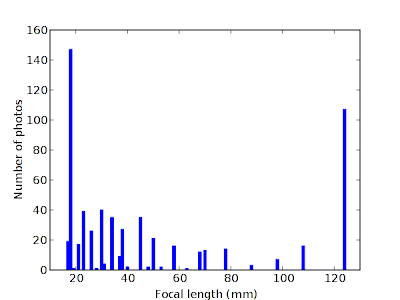 The above is a histogram of the focal lengths I used on my recent backpacking trip to Stevens Canyon (full trip report coming soon, btw). I took two lenses: a Sigma 17-70mm, and a Sigma 18-125mm. The latter stayed on the camera most of the time. As the two modes are at the extremes of the zoom range, this shows that I would have used both shorter and longer focal lengths if they were available. Similarly, activity is present throughout the zoom range (much of the "chunkiness" is due to quantization of the focal length reported by the camera in EXIF). A superzoom is essential for my backpacking (as I have no patience for lens changes while on a trip).